I put together this ZenMate VPN “free guide”, on steps for obtaining a fully functional, free trial account of the premium plan. As well as how to download the free version of the popular VPN. Updated in 2019 — enjoy! Want to head on to download the free version and skip this guide? 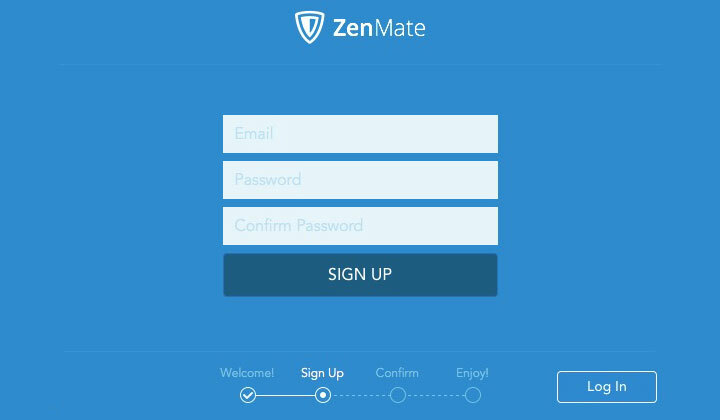 Click here for the legit free ZenMate VPN download link. 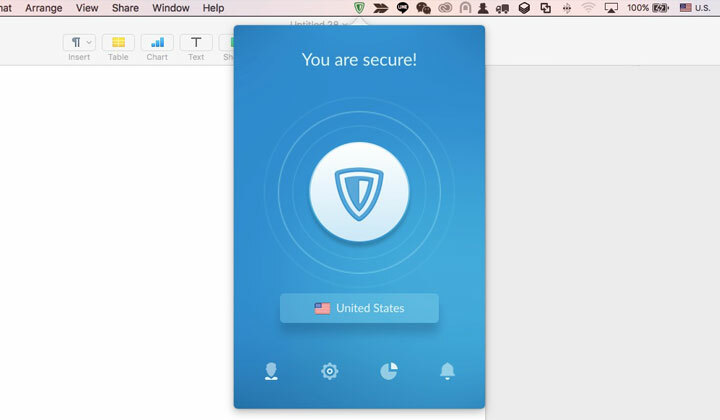 The secure VPN connection client is available for Windows and Mac (macOS) desktops, as well as Android & iOS mobile devices. There is also an easy to use web browser extension or plug-in for Chrome, Firefox and Opera. Note; this is not a crack, or any nulled version. Any sites claiming to offer such free downloads, are more than likely spreading malicious or harmful content. In this guide, I’ll demonstrate the steps to accessing free premium VPN servers in the following countries — account sign up is straight forward. 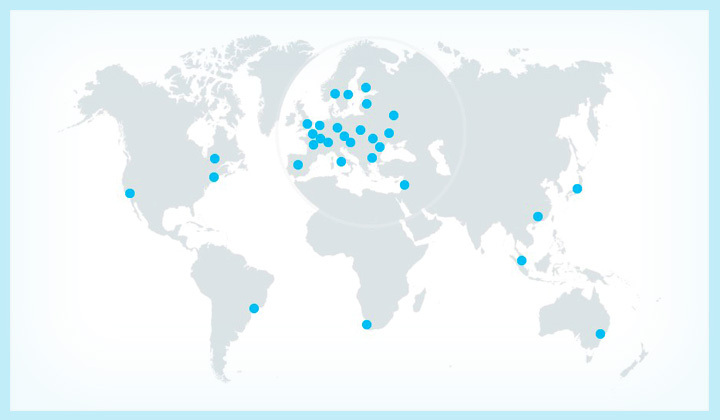 Australia, Austria, Belgium, Brazil, Bulgaria, Canada, Czech Republic, Finland, France, Germany, Hong Kong, Israel, Italy, Japan, Latvia, Luxembourg, Moldova, Netherlands (Holland), Norway, Poland, Romania, Russia, Singapore, South Africa, Spain, Sweden, Switzerland, Ukraine, United Kingdom (UK) and United States (US). 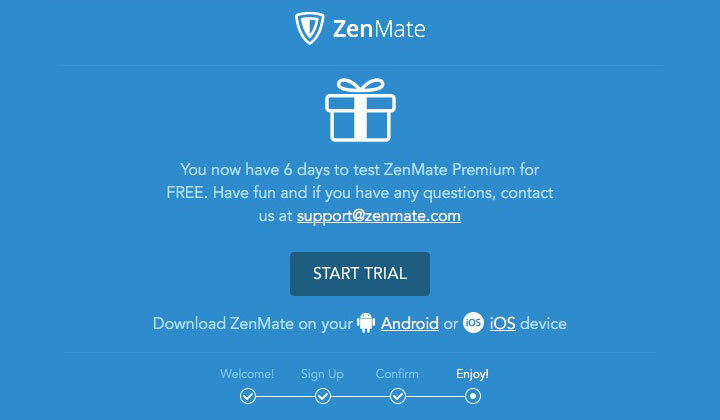 To obtain a completely free premium account, and unrestricted trial of ZenMate VPN for 7-days, please go through each below step in detail. No credit card or payment is required. This is not the same as a money-back guarantee deal most other VPNs are offering. No codes, or coupons needed. Step 1. 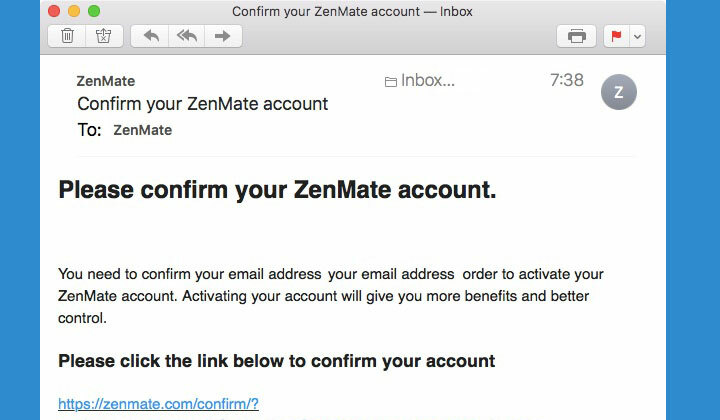 Make sure you are not logged into, or using any ZenMate account. Step 2. Click here to download the premium ZenMate version. Step 3. Choose your device accordingly (Mac, Windows, Android, iPhone, iPad, etc. or web browser extension), and you are ready to start the free trial sign up. Step 4. Choose your desired language, and click on “Next”. Step 5. All you need is an email to sign up to free premium, then proceed! Step 6. If account creation was successful, they will send a verification email. Step 7. Click on the VPN account verification link on the verification email. Please note; if you cannot find the email in a few minutes, please check your spam or junk mailbox folder from your mail provider. Step 8. Your account will be immediately activated, ready for use. Just click on the “start trial” button, to finally activate the free trial period of 7-days. Step 9. You are ready to go. Enjoy your free week! Choose your desired country location from the list of VPN servers, and click on the ZenMate logo to establish a highly secure VPN connection. This secure, and anonymous connection will cover all of your internet activities for the duration of the free trial period, which should be 7 days. After the period is over, you will see a message that states; “Free trial period expired, you do not have any days left on your subscription”. And from there you have the option to purchase a monthly, half a year, or yearly upgrade. The latter being the most affordable, with savings up to 44% from the regular premium VPN price. Please note; that uninstalling and re-installing the VPN connection client, then registering with a new email address to extend your free trial likely won’t work. The software registers your Mac address, which prevents from enabling multiple trials for the same device. The VPN is reasonable priced and a quality service to which I recommend upgrading to if possible. Infinitely free VPN plans that are as secure as ZenMate or any other quality VPN provider simply do not exist. Thus going free VS premium debate is absolute. A restricted, but completely free VPN version for indefinite use, did exist on ZenMate previously. However, because of abuse, this has been discontinued. Previously if a users trial expired, their account was reduced from premium to free. So that an upgrade was voluntary, however this would only allow one or few VPN country locations and deprioritized connection speeds. 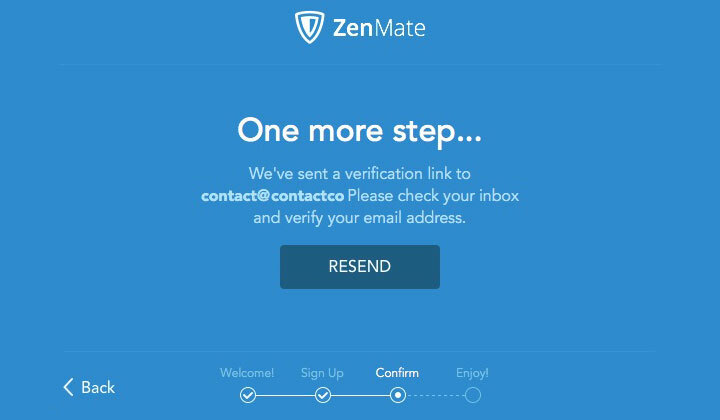 This has also lead people to believe that a free download version, cracked, nulled or otherwise offered by some malicious or suspicious websites would enable a free premium ZenMate account. This is not true however, and the only way is to download the software directly, and safely from their website. Because of the nature of VPN technology, all accounts have to be validated on the server side and therefore there is no way to fool their system. Also any kinds of coupons, or codes for registering fully free account are unfortunately nothing but a myth, perhaps being circulated by some online forums. And, hope that clears up everything. 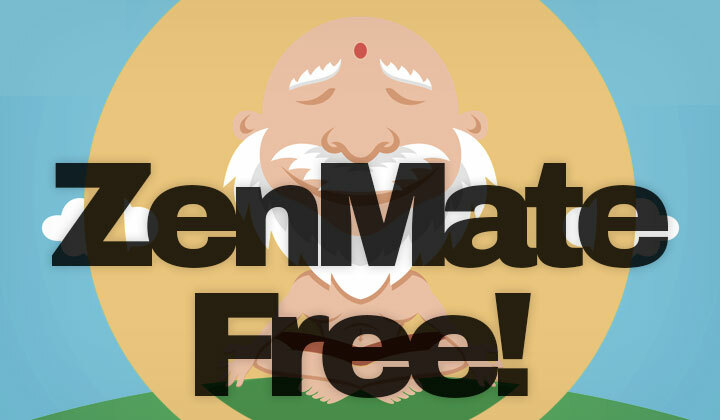 Click here to read the official word on free accounts from ZenMate! Aany questions about ZenMate VPN services? Is your free trial, or free version working for you? Comments below. End note; Some third party services, such as the one located at zenmate.com, are affiliated with the blog and hyperlinks pointing at their site can result in monetary benefit. A cost free way to support the work. Biggest thanks, David.